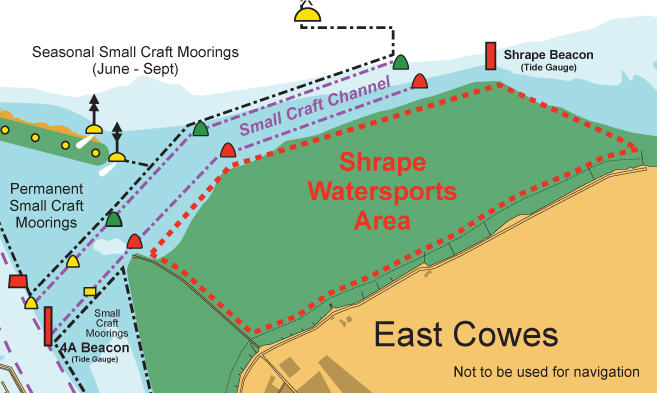 Cowes Harbour Commission introduced a Shrape Watersports Area within the Inner Harbour in 2015, (see General Directions 2.32 and 3.4). The Shrape Watersports Area is not to be used for activities involving the towing of persons; such activities are prohibited within the Inner Harbour and Outer Fairway (see General Direction 4.4.1). Vessels not involved in the above activities are advised not to enter the Shrape Watersports area and to keep to the Small Craft Channel.